The power and beauty of one of the world’s natural wonders draw visitors to Niagara Falls, the collective name of three waterfalls lined along a sharp, narrow curve on the Niagara River straddling the border between the U.S. and Canada. Watching the endless volume of water approach the precipice of Horseshoe Falls, American Falls and Bridal Veil Falls then drop, boiling and churning white into the gorge below is mesmerizing. The Neutral Indians were one of the earliest native tribes known to have lived on both sides of the falls they called Onguiaaha, which means “the strait” or “thundering water.” The first European to see the falls was French explorer, Father Louis Hennepin in 1678. This region of the Great Lakes became strategically important during the early struggle between nations to control North America. First the French, and later the British, built forts to protect access to the westward route through the Great Lakes. Small communities grew up around the falls on both sides of the strategic Niagara River. They eventually became Niagara Ontario and Niagara New York when boundaries established along the center of the river divided the falls between the two countries. Horseshoe Falls is on the Canadian side; American Falls and Bridal Veil Falls are on the American side. In the mid-1800s, the spectacular beauty of the falls began attracting curious sightseers, romantic honeymooners, and daredevils who tried to conquer the falls in dramatic ways. Simultaneously, the number of factories using the river for power increased. This growth became the subject of a growing concern over the long-term impact of tourism and hydroelectric power on the natural wonder and the river that fed it. On the U.S. side, these concerns led to the Free Niagara movement, whose membership included famed landscape architect, Frederick Law Olmstead. Their efforts in the late 1800s resulted in the creation of Niagara Reservation State Park, America’s oldest state park, and the inclusion of both American falls within the boundaries of the protected park. To this day, visitors walk along scenic park footpaths through wooded areas along the banks of the Niagara River to reach fall lookout points. At the same time as preservation efforts unfolded, Nikola Tesla’s development of the alternating current system for power transmission led to the controlled use of the natural power source shared by both countries. The falls are the main event in both cities. Both have magnificent fall views. The Canadian side has a long, clean panoramic view of all three; the U.S. side has several closer views of the three. Each city has its own vibe. Niagara Falls Ontario is larger, more commercial and more crowded. Queen Victoria Park is the primary viewing access, with a wide paved sidewalk along which commercial activity thrives to the edge of Horseshoe Falls. Niagara Falls New York is smaller, less developed, and feels closer to nature. Access to fall viewing areas is through Niagara State Park. Maid in America Tour covers it all! It’s the way to see the falls from the American side from many angles, and by land and river. Viewing them from high above in Prospect Observatory is amazing. Experiencing the thunder and power of Horseshoe Falls up close while cruising the base of the Gorge aboard Maid of the Wind is thrilling. Venturing behind Bridal Veil Falls by walking down into the Gorge through Cave of the Winds is incredible. Walking to dramatic Hurricane Deck is a must do for the adventurous. Get your tickets for this amazing 4-hour tour through Trusted Tours. 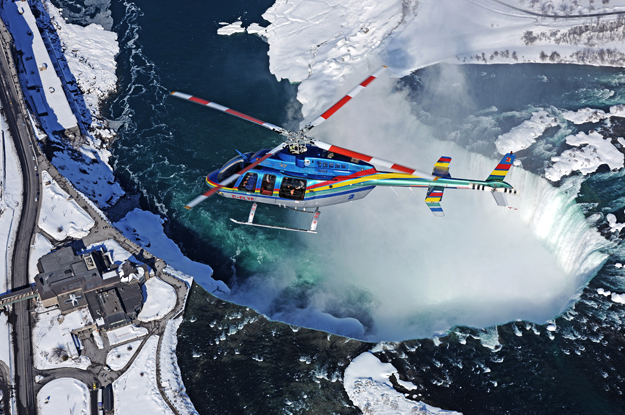 Niagara Falls Helicopter Ride is a spectacular 12-minute thrill ride over the three falls, down the Niagara River to Whirlpool Rapids and Rainbow Bridge. From the hovering helicopter, see how Goat Island diverts the swirling river around it to create the three falls roaring over the precipice. 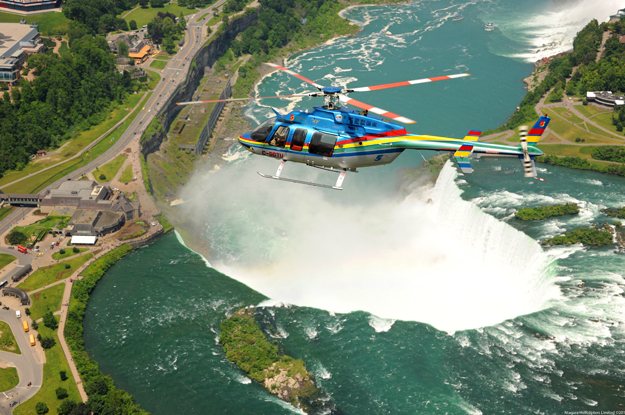 Swooping down to fly along the curve of Horseshoe Falls is a once-in-a-lifetime experience! Get discounted tickets for this incredible ride through Trusted Tours. Canadian Rainbow Tour is a super way to see the Falls from the Canadian side. The 4-5 hour tour, morning (8:30 am) or afternoon tour (1:30 pm), departs from the U.S. side and crosses the border via Rainbow Bridge. Both morning and afternoon tours go to the top of Skylon Tower for wonderful panoramic views. 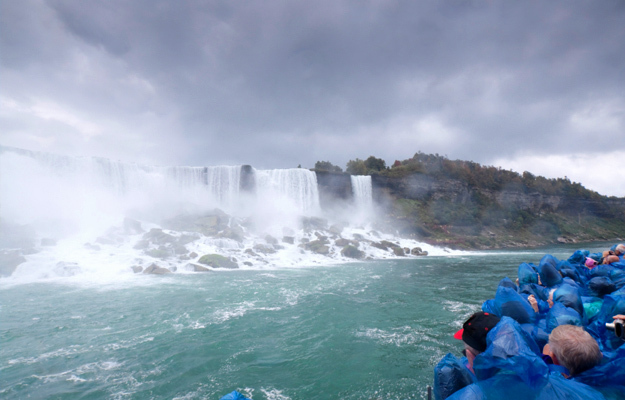 The morning tour includes the thrill of experiencing the roar and mist from the base of Horseshoe Falls on Hornblower Niagara Gorge cruise. The afternoon tour substitutes the Gorge cruise for an awesome Journey Behind the Falls experience. Imagine descending 150 feet by elevator through the bedrock behind Horseshoe Falls and walking through a tunnel leading to two portals and outdoor observation decks behind the falls! Important note: Be sure you have the required travel documents to present at each country’s border crossing. Decide whether the morning or afternoon appeals to you and purchase discounted tickets through Trusted Tours. In addition to having similar fall-related activities and attractions within a 5 to 10-minute walk from each other, both cities have a mix of attractions, casinos, hotels, shops, and restaurants. The Canadian side has more of everything than the smaller, quainter U.S. side. In addition to great viewing areas, Niagara State Park on the U.S. side is the location of Niagara Gorge Discovery Center whose interactive exhibits and short films interest visitors. The park is also the access point to the ruins of Schoellkopf Power Station, a fascinating look at harnessing the energy produced by the falls. Hiking trails of various degrees of difficulty wind through the park. Niagara Gorge Trail and Goat Island trails are popular. Within walking distance of the park, young children enjoy the small Aquarium of Niagara and adults are drawn to the Seneca Casino. Drive 20 minutes along the scenic parkway for a wonderful visit to Old Fort Niagara, built by the French in 1726. On the Ontario side, the majority of things to do are in the outlying tourist and entertainment district of Clifton Hill/Fallsview. It’s a busy place, filled with wax museums, a giant indoor water park, a huge arcade, antique cable car rides, an IMAX theater with a daredevil exhibit and familiar chain restaurants. Adults enjoy casinos, and nature lovers can easily access Niagara Recreational Trail which runs through the city into the picturesque countryside.